Are you building a new home and looking to have your property cleared and graded in preparation for construction or your landscaping? Does your property need to be regraded with more of a slope away from your home? We regraded this gravel driveway, filled in all the pot holes, and topped it off with a fresh layer of gravel. Property grading problems are the number one cause of foundation issues. If improper grading is not addressed, it can cause water to pool near the foundation, and over time may cause foundation cracks, or even basement flooding. While water pooling is typically a side affect of poor grading, this is not just limited to beside houses. Poor grading of a driveway can cause the driveway to hold water, causing soft spots, and ultimately pot holes. Poor grading in a yard can cause flooding or ponding – which is to say it won’t drain away. You’ll often see this in the form of a swampy area. They’ll stay wet for far longer than the rest of the yard, or maybe even not dry out at all. They are often difficult to mow because of how soft they are, and can be a breeding ground for mosquitos. The size and severity of the grading issue will dictate how we solve the problem. All but the smallest grading projects will involve heavy equipment. 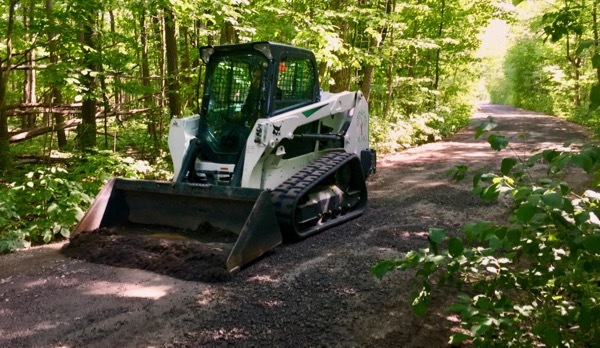 For gravel or dirt driveways, we will typically use our skid-steer with either a bucket, or harley rake. We use this equipment to move, spread and finish materials. Depending on what state your driveway is in, we may need to import some new material. 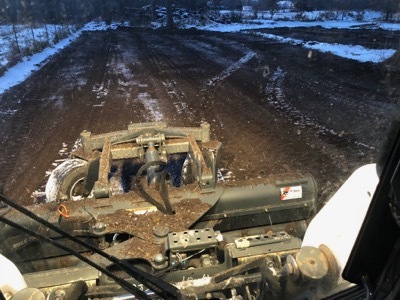 For grading projects, where we’re changing grade significantly, we might use an excavator, or a bulldozer, or in smaller areas a we’ll use a mini excavator or mini skid-steer. For yard areas, we can finish with seed, hydroseed, or sod. We believe in providing great service and value with every project we complete! If you’d like an estimate to grade or clear, or excavate on your property please give us a call (343) 262-4769 or fill out our contact form and we’ll get right back to you.